This is a typical dish of the Mexican cuisine as it is prepared all around Mexico. The dish is simple as it only consists of the red rice fresh flavor accompanied of carrot’s sweet flavor and peas’ peculiar flavor. – All these ingredients together make the dish look full of color , flavor and aroma . The Mexican rice is very versatile as it is excellent to be served as entree plate or to accompany a wide variety of Mexican dishes such as: grilled steak , shrimp brochettes with achiote , quesadillas , enchiladas , pork in adobo , etc. Without a doubt this rice is the perfect garnish for almost any Mexican dish. *It is believed that the rice comes from the Ancient Civilizations that inhabited Mexico but this is incorrect. 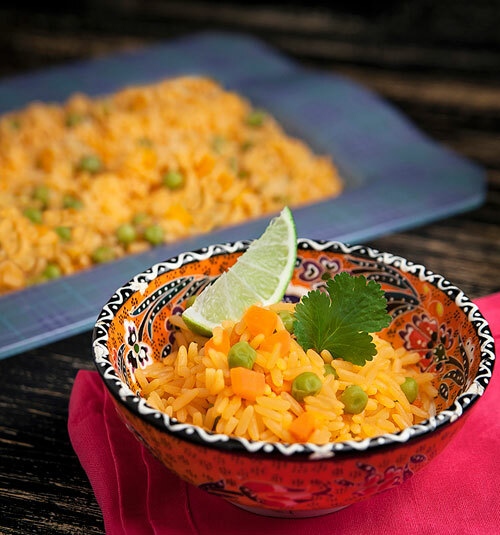 The rice was brought by the Spaniards and it was quickly incorporated and adapted to the Mexican cuisine. Making this rice is not difficult, just some tricks have to be known that we’ll be teaching you. Don´t forget the “golden rule" to cook the rice. The liquid has to double the rice. To obtain the best results use a saucepan with thick bottom and not too tall. The peas, that are used in this dish, can be bought canned or frozen. The total preparation time is of 25 minutes , however while the rice cooks (20 min.) you won’t work in the recipe. This recipe serves 6 portions. Pour in a measuring cup the mixture that was blended and verify that you have 4 cups of salsa (1 qt); then reserve. If you would have more than 4 cups remove the remaining salsa and if you would have less than 4 cups of salsa add water up to the 4 cups mark. Dice the 2 carrots that were peeled and reserve. Rinse in a strainer 2 cups of white rice, then set aside. Heat in a saucepan over low heat 3 tablespoons of olive oil. Put in the saucepan the 2 cups of white rice that was rinsed and fry it for about 3 minutes, until it acquires a golden color; stir constantly. The 4 cups of Red Salsa that were measured. The dices of the Carrots that were cut. When the cooking is done turn off the heat and leave the Mexican rice resting for about 4 minutes, until the rice grains absorb the moisture and are loose. Tip: Put lime to this rice, it tastes delicious. Suggestion: Accompany the Mexican rice with fried plantains , you have no idea of how tasty is this combination. Variations: Try other Mexican ways of making the rice: white rice , Puebla style rice , peasant rice , etc. Did you like the Mexican Rice? Measure all the ingredients that you are going to cook to perfection with this set of measuring cups and spoons. The set consists of 19 pieces, measurements are given in 2 measuring systems and the best is that the set will last forever. The “Woll Nowo Titanium Saucepan" is magnificent because it is easy to clean, nothing sticks to it and as the handle is detachable it is easy to store. The price is high but worth each penny that you invest in this saucepan. The “Olive Wood Spoon" is perfect to cook this rice. It is very pretty, very resistant and it has a very good size.